Relining an impression leads to inaccuracy, though many dentists assume it will save them money. For our final post on impression troubleshooting, we’re looking at an issue that arises when dentists mistakenly assume that cost-saving measures will actually use less time and money in the end. In the previous seven impression troubleshooting blogs, we focused on successful preparation design and clinical superiority. If you want to avoid lab confusion and remake headaches, it’s all about seeing the impression from the lab’s perspective. It’s a common scenario at the office: You’re taking an impression and don’t get everything you want from the result. The patient waits expectantly as you prise the material out of their mouth and examine it with a look of dissatisfaction on your face. Then you must make a choice. 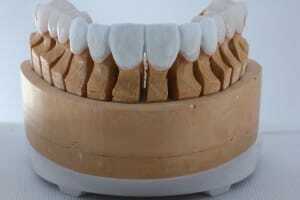 Do you reline the impression to save the cost of a new tray and material or do you start again from the beginning? If you want an impression that the lab can actually use, you must completely re-do the impression. Many dentists mistakenly believe that relining will result in a more accurate impression, but this is the exact opposite of the reality. Relining makes it almost impossible to seat the impression correctly. Not only will it be harder to put back in the mouth (more material, same space), but you can never precisely position the impression. The inevitable consequence is that you create a double copy of the prepared tooth inside the impression. There isn’t enough space for the impression to seat fully with new material inside of it. To really “think like a lab,” check out the previous seven impression challenges in our troubleshooting series. How to recognize when over-emphasis on conservative dentistry can affect the quality of the impression. How to prevent “tear-outs” when impression material flows in black triangles and material is difficult to remove.